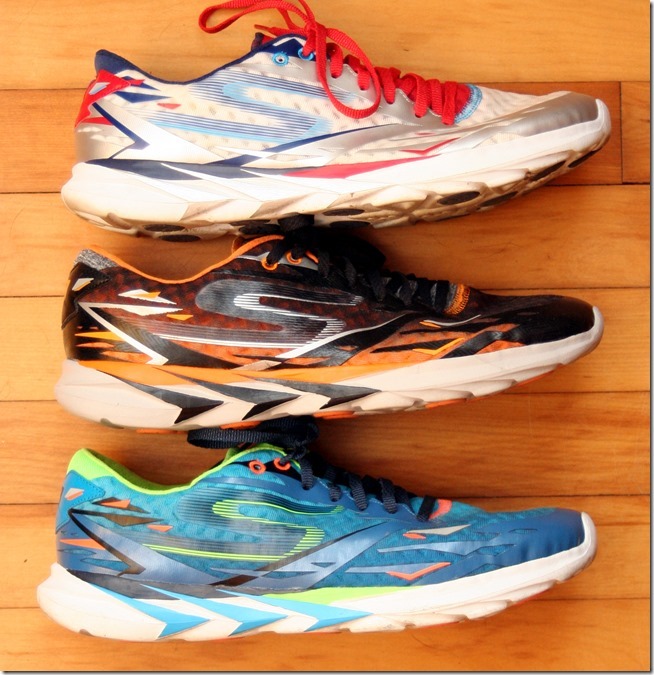 Among the Skechers Performance lineup of shoes, my favorites have been the GoRun and GoBionic models (unfortunately the latter is being discontinued). I ran in the GoRun Speed 1 and 2, but the shoe was not a great match for me. A little too narrow, a little to firm under the heel for long distances, and a bit too much stack and weight for shorter speed workouts/races. It just didn’t fit well into my training arsenal. 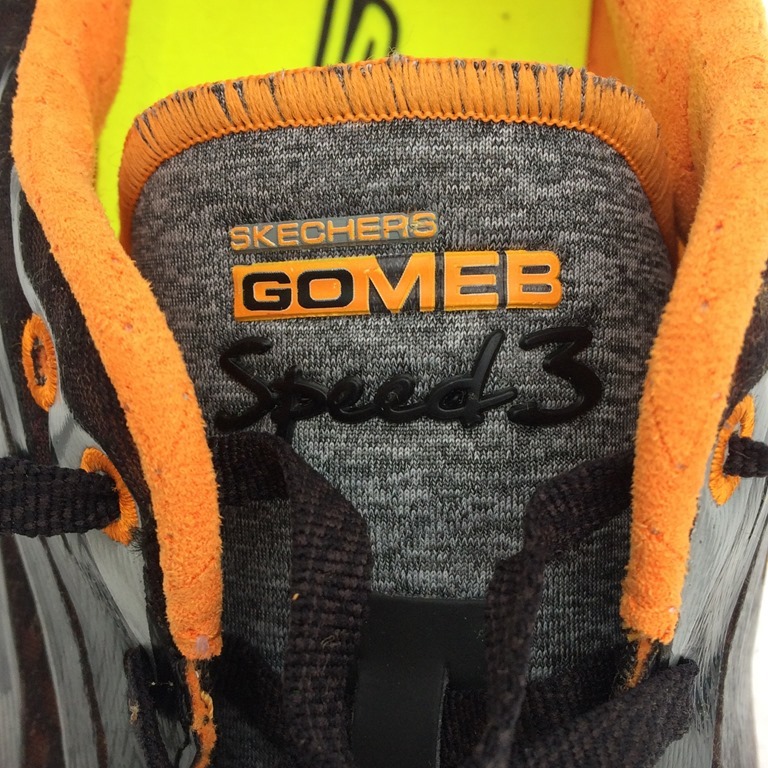 I received my first wear-test pair of the Skechers GoMeb Speed 3 last February and I was impressed (Disclosure: I’ve been helping Skechers out with shoe development for several years). The prototype that I received felt markedly roomier with a stretchier upper mesh, felt considerably more flexible, and had a more resilient/bouncier feel underfoot. It felt like a very different shoe from the previous models (note: the name has been changed from GoRun Speed to GoMeb Speed). As often happens in the development process, things change as shoes develop from one iteration to the next. 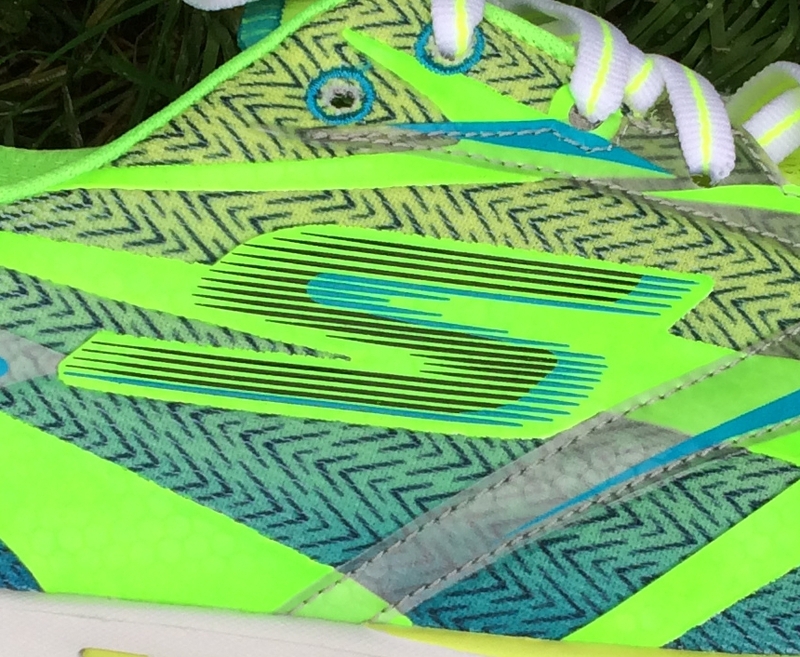 Skechers receives input from a lot of wear testers, and this particular shoe is designed and named for 2014 Boston Marathon winner Meb Keflezighi. As a result, Meb has a lot of input into the design. Though I loved the first iteration I received, it felt a bit less like a race shoe and more like the GoRun to me, and that needed to be fixed. In particular, the sole had an incorrect plate (visible in midfoot region of photo below) so was not as stiff as intended, and the upper material was changed to one with less give for a more performance fit (that’s how I interpreted the changes). Fortunately, the next protoype ran just as well as the first one. The sole still felt a bit more resilient, and the shoe had a slightly stiffer, racier feel to it. 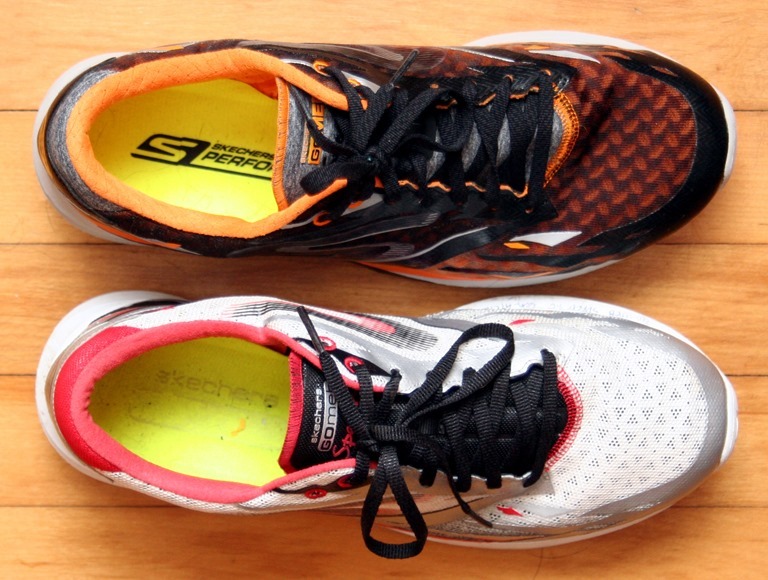 Though the upper material had less give, it still felt a bit roomier than the GoRun Speed 2. Other changes from v2 to v3 include a slightly more padded ankle collar, and a softer interior lining of the upper which makes for more comfortable sockless running. The GoMeb Speed 3 also gains a bit of weight over v2 – the size 10 production shoe that I have (NYC version) weighs in at 7.9 oz vs. 7.2 oz for my Speed 2 in the same size. I don’t really notice the difference on the run. 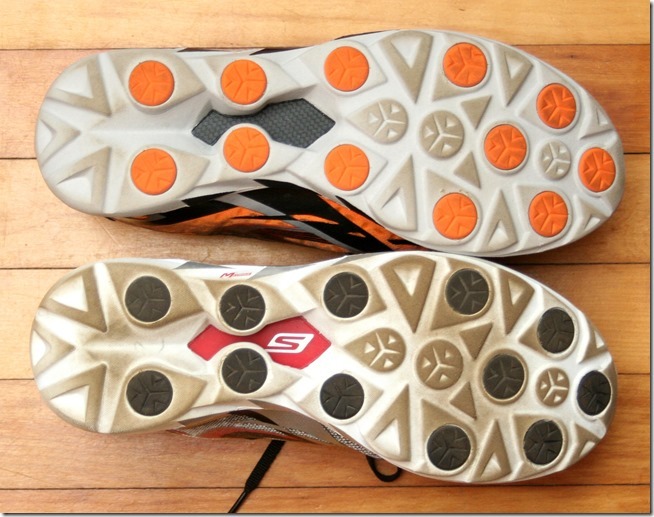 I’m pretty sure the stack height has remained the same at 18mm heel, 14mm forefoot. As sometimes happens in the shoe development process, features are added that generate some amount of passion and controversy. In my review of the Skechers GoRun 4 I discussed my feelings about the addition of a Quick Fit Portal to the tab behind the heel. The QFP is a hole that you can slip your finger through to help pull the shoe onto your foot. I received a prototype of the GoMeb 3 that had a QFP (see photo below) and didn’t think it was a good idea in a shoe with a stiffer heel counter than the GoRun. I could feel the margins of the portal against my skin and felt that the risk of abrasion outweighed any benefit. Fortunately it was decided that the QFP would be left off the GoMeb. In all, I went through four iterations of the GoMeb Speed 3 to arrive at the final version, pictured below. The end product is a really nice looking shoe that feels like a much better match for my stride. It’s still a firm shoe, but it has a bit more spring under the heel, and the fit up front is just a tad more forgiving. 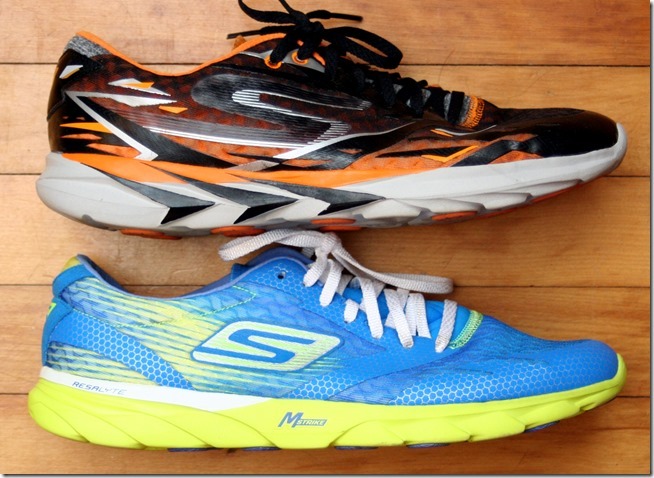 I raced a 5K in the GoMeb 3 last Spring – wasn’t my best race but I don’t blame the shoe. It’s a bit more shoe than I Iike for a 5K (Skechers needs a sub 6 oz speed flat! ), but should serve well as a 5K race shoe for many. More importantly, it’s now a shoe that I’d be willing to use for long miles and races up to the marathon. 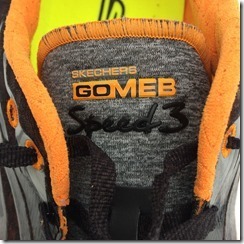 I’m very impressed with what Skechers has done in this update to the GoMeb Speed. The changes aren’t huge, but are just enough that both the fit and ride are much more to my liking. It’s a great looking shoe, and it’s tough to argue about performance – it is Meb’s marathon shoe after all, and was on his feet when he won Boston last year. If you’re looking for a racing shoe that’s a bit more forgiving than the typical flat, the GoMeb Speed 3 would be a great choice. 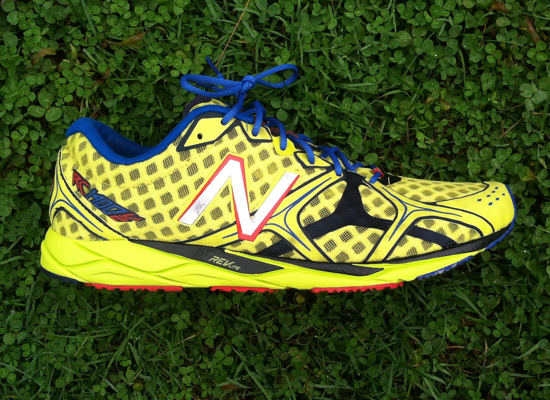 For some additional thoughts on the GoMeb Speed 3, see this video review by Caleb Masland. The Skechers GoMeb Speed 3 sells for MSRP $120 and can be purchased at Running Warehouse and Shoebuy. Well, it looks like Skechers has moved into big boy territory. Not just with their shoes, but with pricing as well. I wish they would have kept pricing sub $100 on all their performance line. Great review. Thanks. Thanks for the review. I think I’ll pass though as I’ve been disappointed in the GORun Speed 2 after quite liking them initially for their lightness and feel. I found out they hurt my Achilles for some reason, offer little “bounce” in the forefoot and the sole wears out very quickly. The “cardboardy” feel of the upper is not great too…the Adidas Adios Boost 2 works a lot better for me. hollyoak, same experience with the gorun speed2. I did have a PR marathon with them, but by the end the calves were cramping up. 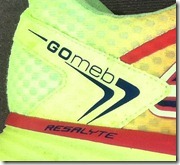 I’m a little shy about trying out the gomeb3 as a result, particularly when the gorun is so good. Great review. Can you comment on the shape of the shoe, curved, semi-curved, striaght? From some of the pictures the 3 looks less curved than the 2. No sure, don’t feel curved to me. 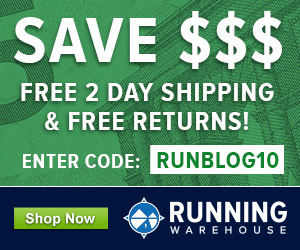 Any thoughts/comments how this compared to the GoRun4? Stiffer, firmer, and a bit narrower than the GR4. I don’t get their pricing strategy either… In that ballpark, you have many other great competitors, including the Adidas Adios Adizero Boost 2. 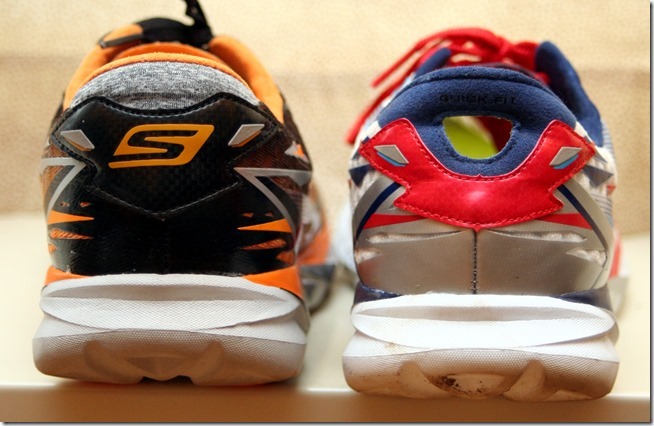 And let’s be pragmatic, it will take a few years more until Skechers is able to produce something similar. So, going back to my opening statement, either Skechers keeps its prices under control, or they will fail to increase their market share. What will be interesting is how hard they police pricing at online retailers. If I recall correctly the previous versions were in a similar MSRP price range but could be found online much cheaper at various outlets. They are trying to break into specialty retail but will need to control online discounting in order to do so effectively. We’ll see if they show up on Shoebuy for 20% off. 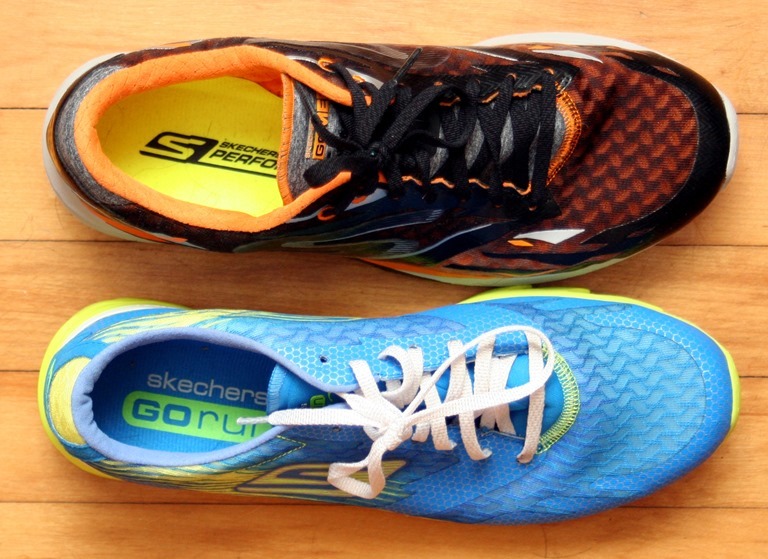 I for one am not thrilled Skechers moved away from the GObionics as I still run in the their first iteration of that shoe and the first and second iterations of the GOruns; both shoes of which I love. I try to buy new ones that come up on eBay whenever possible. I really don’t see myself getting any of the newer versions of any Skechers shoes. 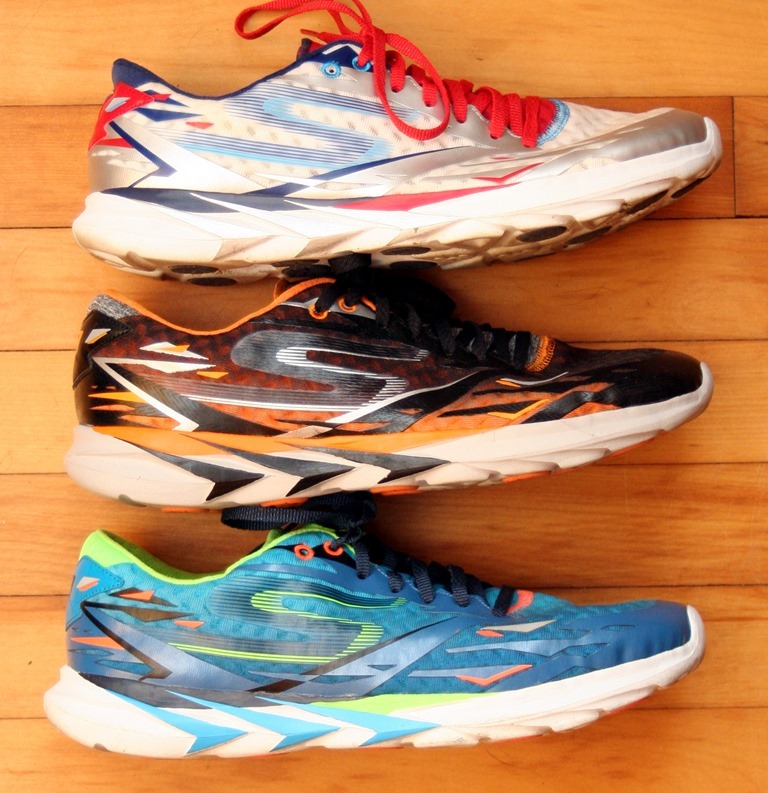 I did a lot of races in 2014, all the way up to a 30k, in the GR Speed 2. I’d been following the changes on the Speed 3 pretty closely, and was happy for the opportunity to score a pair from Amazon last month for $100. The shoes have been a solid improvement over the 2, especially in the mid-foot and upper department. Still probably a little too much shoe for sprints/5ks, but an excellent option for me for anything in the half marathon and up range. I loved the Meb 2, have 3 pairs about to be retired, and ran Chicago in them last year, as well as used them for all my long runs. Great shoe in my opinion. Very minimal, firm and just a shoe that “didn’t get in the way of my running”. I received my pair of Meb 3’s today and unlike the 2’s they seem to have less room in front of my toes. Do you think they are sized smaller than the 2’s in general, and if so, should I try a 1/2 size bigger? Or, is the pair I received possibly defective and another pair in the same size might fit similar to the same size in the 2’s? The bottom of the shoe feels different, more like the GoRun 3’s, but not quite as pronounce a rocker feel, but definitely some type of rocker as opposed to the completely flat sole of the 2’s. Thanks in advance for any feedback/advice. I did not notice any difference in sizing, if anything the 3’s feel roomier to me. Might be a defective pair, or could be a foot shape difference. Half size up might do it for you. where would you rate these as a potential marathon shoe for you? like seriously considering vs. yeah if i had to. i’d be curious to see your current list of race day options. I’d probably opt for something a bit softer for a marathon, still hard for me to top the Kinvara for that purpose. New Balance Zante and Adidas Adios Boost maybe other contenders. 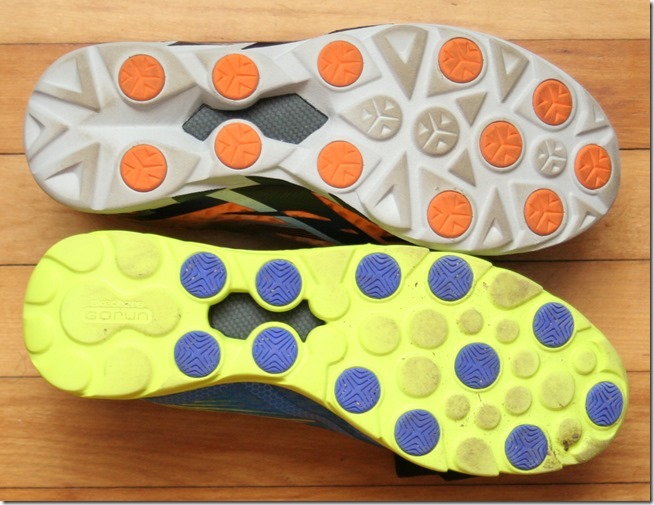 The old Go-Bionic Ride was, and still is, the best shoe I’ve run in, so was really disappointed when they stopped making them. Another annoying thing is that we don’t have any shops selling Skechers running shoes nearby, so I can’t easily go and try on and work out which of the newer range is the best match for me. Which in your opinion is the best like-for-like replacement ? Tough question, the Bionic was a great shoe. Among Skechers the closest would be the GoRun 4, though it may run a bit softer. Probably the closest match I can think of is the Nike Free 4.0. “a little ‘too’ firm under the heel for long distances”. Spotted the typo. What about the width. Its never mentioned. I take an 8.5 D or E. So what is the width of these shoes ? Not a wide shoe by any means. Should be fine for a D width, maybe a bit snug on an E.
So, now the Speed has a knit upper; any thoughts on how that influences the shoe fit? Additionally, I wore a 10 in the S2, and it was perhaps SLIGHTLY too big (length) – what are your thoughts on the sizing of the S3? FYI, I wear a 10 in the NB1400 and a 9.5 in the Adidas Adios Boost 3 (love it, by the way). Thanks for keeping my shoe nerd game up to date! 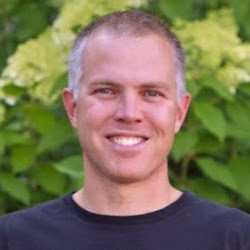 @zach: Matthew Klein reviewed the 2016 Speed 3 in comparison to this version. Not sure Peter likes links to other Blogs in the comments, though. I tried the Speed 3 the other day in a clearance sale but unfortunately found it much too tight – even for a racing flat. Sizing up left too much room in the front for my liking, while width didn’t change much at the same time. It really is a shame. The GoRun4s have become my favourite daily trainers, and I really wanna give the Speed 3 a try. Skechers really amplified their game when it comes to shoes. I remembered they used to simply create them for fashion and not really for heavy-duty things like running. But these days, I find they are almost comparable in terms of performance with New Balance!